Lafayette Place Campground is a good one. Been there a bunch in my youth... If you want entertainment "Clark's trading post bear show" is a must see once in your life. The Problem with your trip is there's so much to do you can spend a lifetime here and barely scratch the historical surface. ENJOY IT! Well... I was going to do an elaborate write up over at ADV but when I boil it down - I went riding in New England for a couple days. I stopped a few places. I camped some. If you read reports over there - this does not qualify. For posterity, I'll add some closure to this thread and vow to do better next time. Plus, I only took about 13 pictures of which only two or three are worthwhile but I'll put more than that here because berkeley you, I took them and you will look at them. 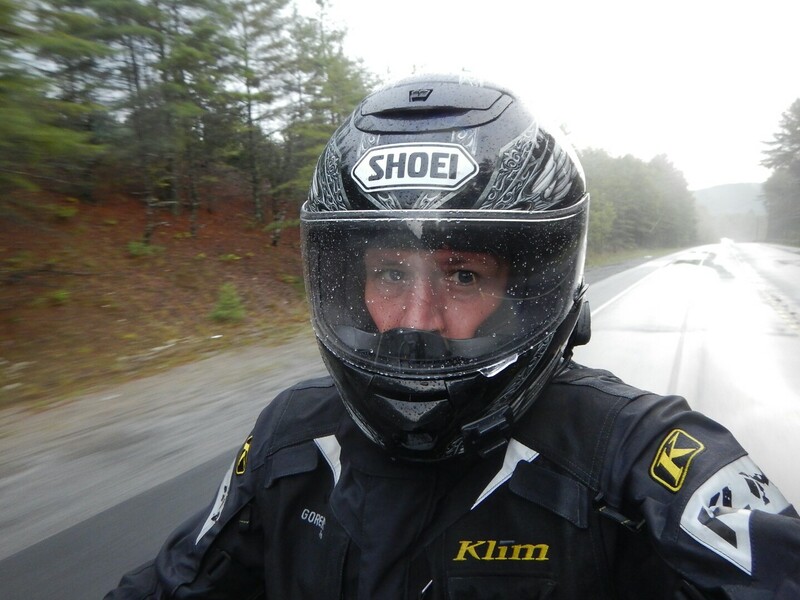 Day one... my friend Mike and I rode from PA to the Berkshires via the Catskills and Hunter Mountain. 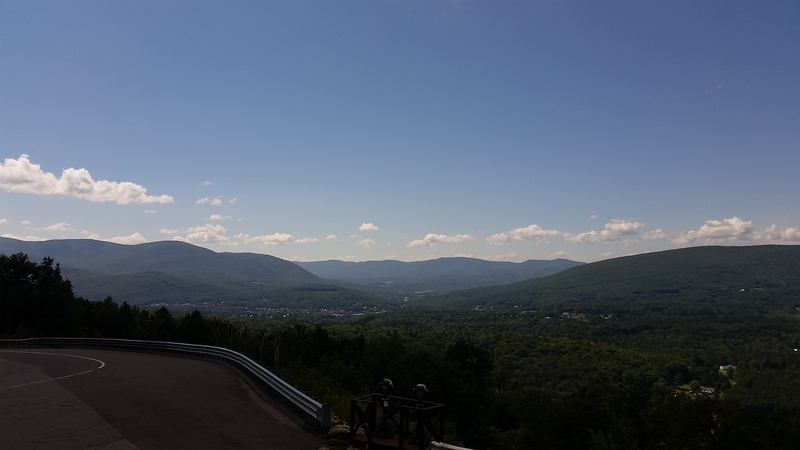 We holed up for lunch and a beer here at the Golden Eagle Restaurant in the hairpin climbing out of North Adams, MA. on Rte 2. A better photographer would have done this shot... but I didn't so here it is from google. From there we rode VT 100 all the way to somewhere then weaved our way over to 112 via backroads and rolled into Woodstock somehow just as the sun was setting. After a little logistical challenge, we camped there for the night. All the campgrounds on my list were full because it's NH in late summer and apparently, that's a thing. Plus there was some kind of huge music festival going on so the ones not on my list were also full. So, we went here and got growlers and pondered our accommodations problem. The next AM we packed up before the other campers needed the breakfast area we were sleeping in, brewed up some coffee and rolled for the Kanc. After some of the roads we had used to get here it was a bit of a letdown and the "pass" is about the same elevation as my house but it was a pleasant way to start the day anyhow. 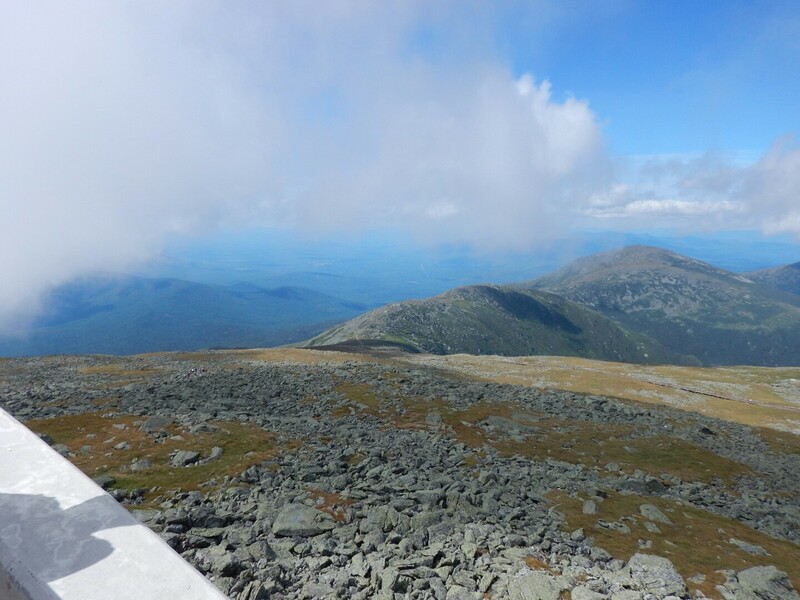 From there we rolled right up 16 to Mount Washington thinking we would be ahead of the crowd. We were. It was closed because of a bicycle race up the mountain. It was scheduled to re-open at 1:30PM leaving us with a bunch of hours to kill. 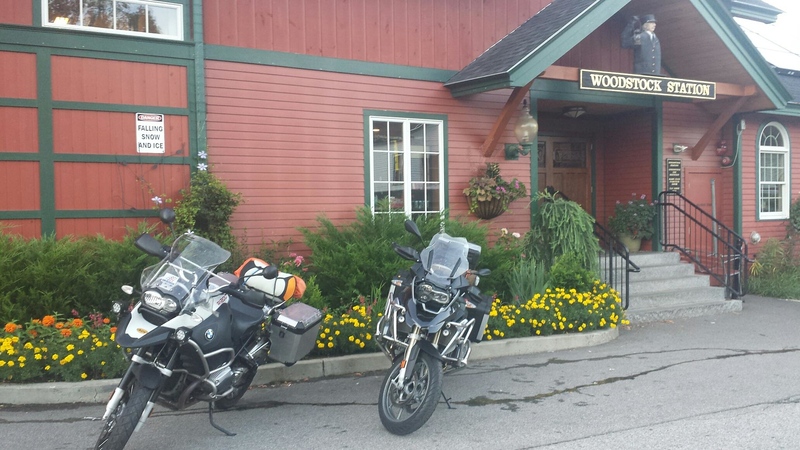 So... we killed a monster breakfast at Welsh's in Gorham, then rode up thru Berlin to Errol. I am sure the scenery on that road was fantastic but I didn't really take notice because it was a smooth, twisty road with long sight lines and we were stonkin' along at "Go directly to jail, Do not pass go" speeds loaded up with full luggage and all. Errol was only notable because it was where I encountered the only moose on the whole trip despite atleast a hundred signs warning us of the certain doom of moose/vehicle encounters. Seriously. 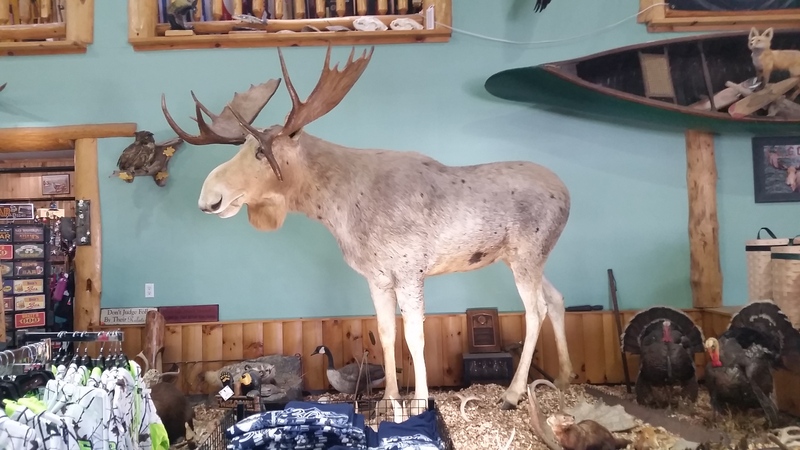 A stuffed albino moose in a sporting goods store. I've skied in NY/VT for 30 years and never seen one of these mythical creatures. I was sure that with northern New Hampshire's reputation for a closer human to moose population ratio I'd finally see one in the flesh. Now, I'm sure the stuffed one is a fake. Moose don't exist. I know. I looked behind every crossing sign. 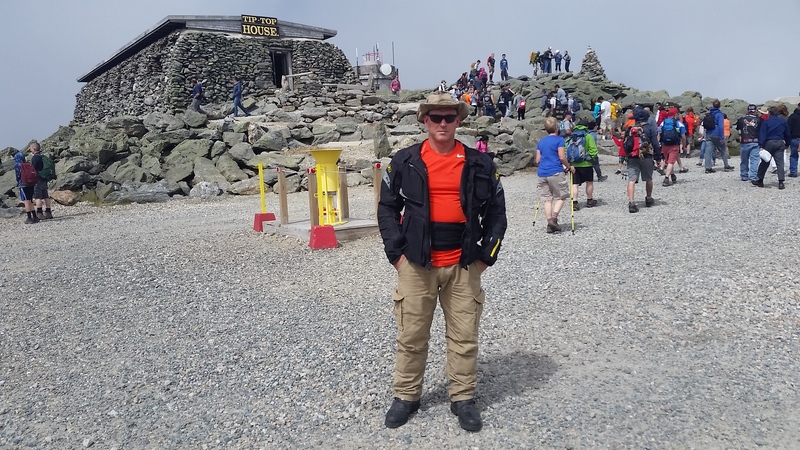 So... back to Mount Washington. We roll up at about 1PM, half an hour before it's set to open and traffic is blocking the road in both directions for a mile. We will not confirm or deny using techniques only legal in the state of California to make our way there but let's say we got to the parking lot more or less undeterred by the throngs of four wheeled visitors. And, when we got there there were about 200 motorcycles already in some sort of formation in the parking lot which we quickly blended right into the middle of. It turned out there was some sort of organized ride going on - so when the mountain opened they held the cars and let all the bikes go first. SWEET! Timing IS everything. And sneaking. That helps. The rest of the day we rode 302, side roads, gravel stuff and hooned around as much as possible given the hordes of vacationers clogging up the roads. 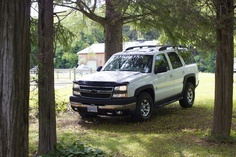 Again we threw ourselves on the mercy of a campground operator and again we were blessed with a spot. This one had a fire ring so we set up shop, went to a bar, ate, got takeout beer, firewood and ended a 12hr riding day properly. I didn't take any pics of that - but it's just as well. 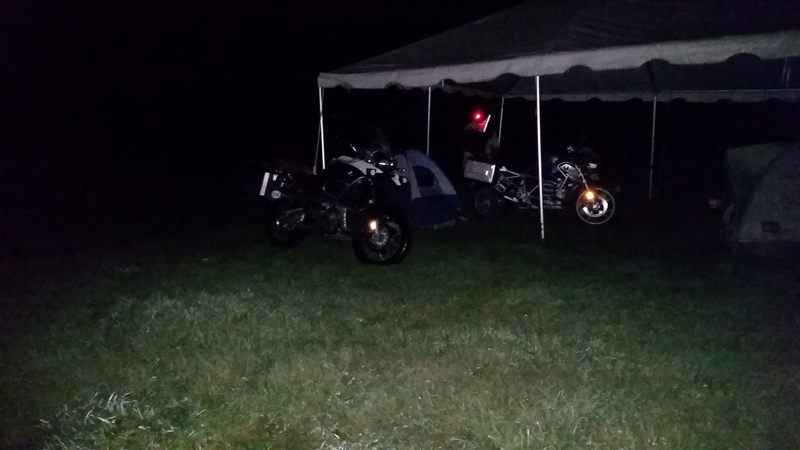 It was a crowded campground with two drunk guys with motorcycles poking at more than one kind of "blaze" and congratulating ourselves on a brilliant trip so far. Day three started out at about 10am after two guys with fat heads folded up shop, got showers and waited for their central nervous systems to recover enough to operate machinery. 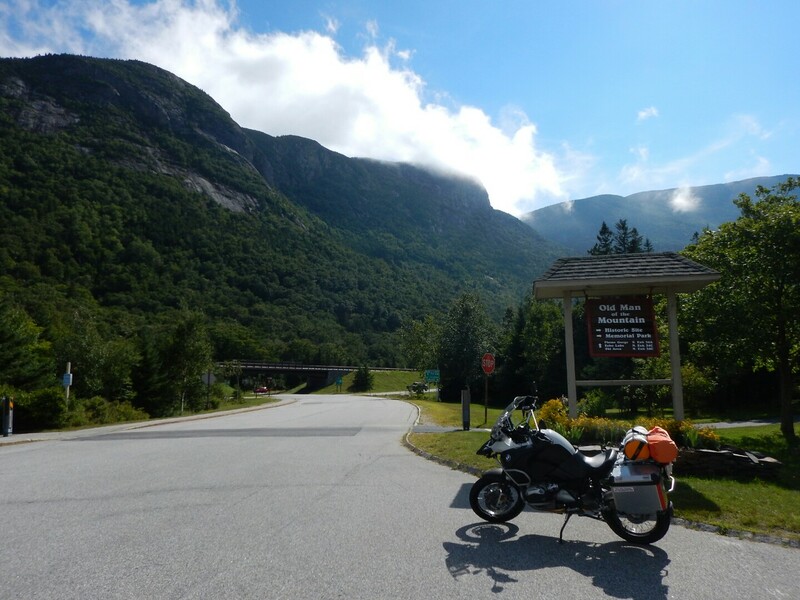 Then it was off to ride thru south thru the Notch, then west on 112 over to VT, Montpelier then up to Stowe for lunch, up and over the Smuggler's Notch, then on to the Champlain Islands. The only real pic from that leg was this one... What Man? It's all beautiful roads and singing in my helmet... until we got to Champlain. 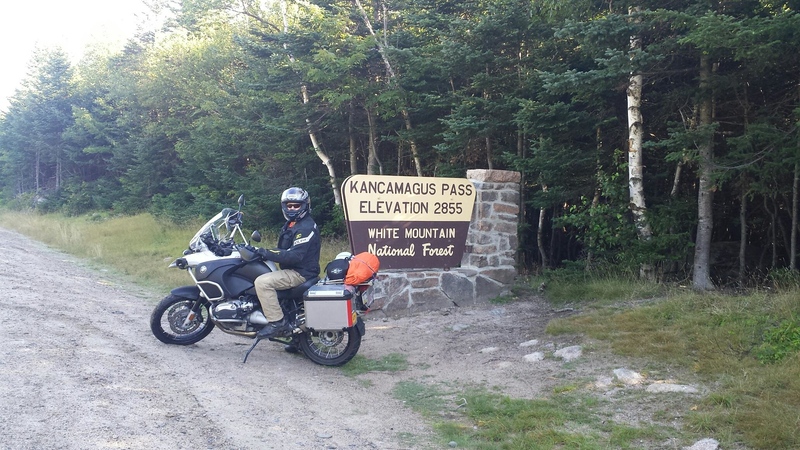 The plan was to ride all day in the Adirondacks, hole up in Placid, wake up, ride south winding our way back down thru NY. But... it got a little damp. Then it got down to business... 2" per hour kind of business. So we got on 87 south and tried to outrun it. Futility. So, sure, why not berkeley with the waterproof camera at 70 miles an hour in unfamiliar deer country in a downpour? After 4hrs of that (and Mike not having rain pants) the temps started to drop into the 50s. His bold attempt to pretend hypothermia isn't real failed miserably. Blue lips and quivering voice gave him away at a fuel stop. 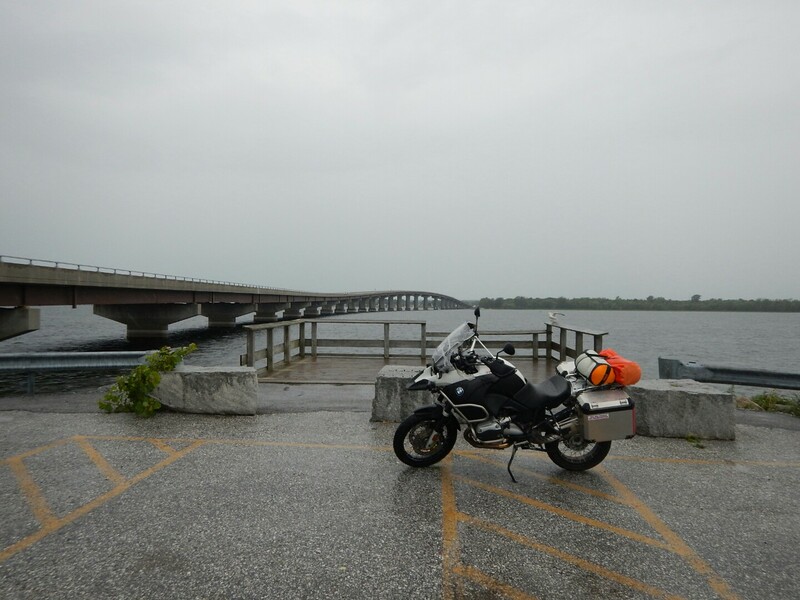 In spite of having good wet gear for myself, hours of driving rain at speed in cool temps had me damp and chilly as well. Just about then, it started to clear up but we were soaked, hungry and only an hour from dark. We got off the highway and began looking for a dry place with hot showers. We were, once again, fortunate to find people willing to take us in with no reservations. 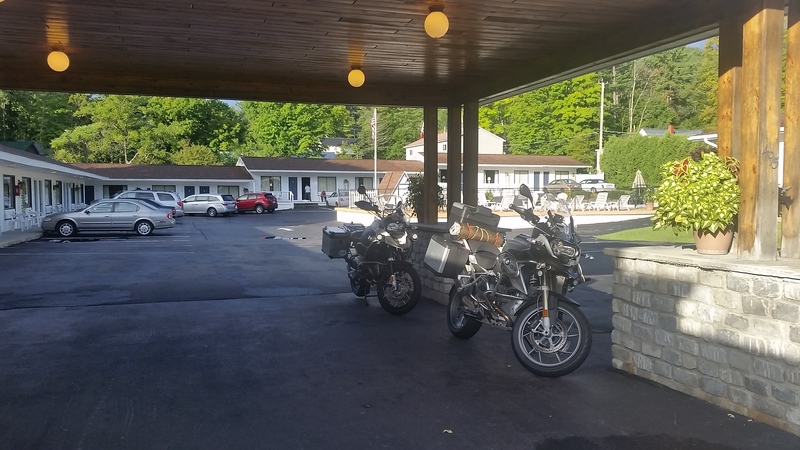 A really nice couple with a little old time motor lodge right in Lake George put us up, dried our clothes, and let us park the bikes under the canopy out front so they wouldn't be wet in the morning. 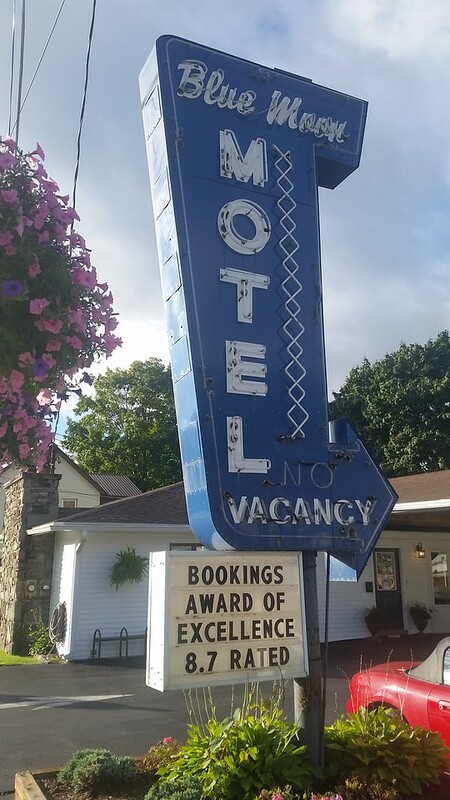 If you happen to visit Lake George, give these guys your business. They were not only gracious hosts, they were nice people who hung out and told stories with us. The room was Felix Unger clean. The price was $90, in season, last minute and the pool was heated. Awesome. In the AM, bikes dry, sun shining... loaded up, went to the diner next door to the hotel for some of the worst breakfast in the history of breakfast and rolled south. I had to meet my family at the beach in south jersey, Mike had to roll home and go to work in the AM so we loosely agreed to ride slab until someone vanished at a split. He peeled off an hour and a half later and I just rolled on stopping only for gas and hydration for the next 6hrs right thru the NY and NJ thruways on a busy, 92F humid, work day for everyone else. 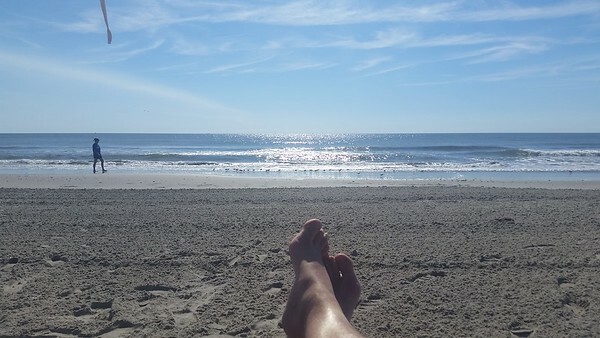 It felt fan-berkeleying-tastic to take the boots off and curl my toes in the sand. Summary: Three 12hr riding days, one 9hr slab day, 2200 miles. No real mooses. Moosi. Meeses. Whatever. I've driven that road at 'lightspeedmotherberkeleyer!' mph before, never seen a police officer. Just don't do it at night or at dusk, because you will find several large moose to ruin your day/life. Trip sounds awesome! You hit a lot of good stuff in the area. 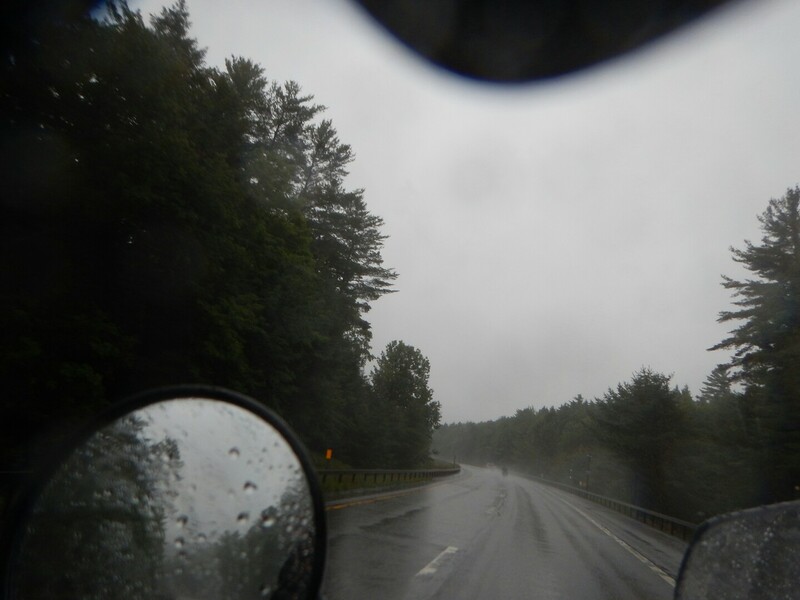 golfduke wrote: I don't want to tell you that I told you the ride up 16 from Berlin to Errol is one of the best 'unknown' stretches of road in New England... but I told you so I've driven that road at 'lightspeedmotherberkeleyer!' mph before, never seen a police officer. Just don't do it at night or at dusk, because you will find several large moose to ruin your day/life. Trip sounds awesome! You hit a lot of good stuff in the area. Yeah, that road to Errol was so good we did it up and back. There was a lot of great riding on this trip I don't have pics for too. Hours and hours of just turning down side roads but keeping a general heading of where we wanted to end up. The countryside is just one beautiful, lush rocky scene after the next. I really enjoyed it. If I was doing it again though I'd go now - with all the families back in school and cooler weather. There was a lot of unexpected density to the RV/boat/camper bus/"hordes of Harley" type traffic and with the unseasonably warm temps - it was very uncomfortable to be patient and bake in the sun. I am not what anyone would describe as patient so there was a lot of opportunity for law enforcement to make bank on our passing techniques. Fortunately - there wasn't a lot of law enforcement.